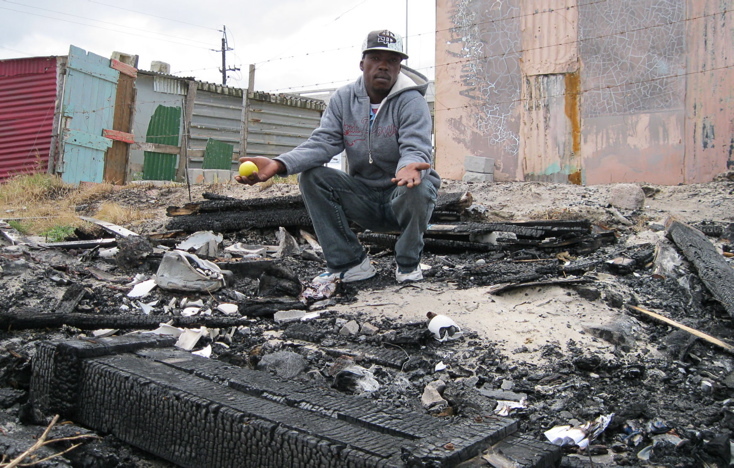 Believing a young man in their community was responsible for robbing a house, about 20 residents of Khayelitsha’s Enkanini squatter camp beat him up and burnt his house down.But 25-year-old Thembelani Sokolo says he is innocent. He has lost all his possessions and has nowhere to stay and has laid a charge of assault and arson against his attackers at the Harare police station. Sokolo says his life changed on Friday last week when a group of residents burnt his shack down while he was at work. Arriving back home, he saw his home in flames and asked his neighbour what happened. His neighbour pointed out a group of people walking down the road and told him they were responsible. Besides being left with nothing but the clothes he was wearing, he also had to go to hospital to get stitches on his eyebrow and on gashes to his head. Now he’s involved in a row with the community after opening a case against them. Police arrested three people after he lay charges later that day, but they are all back in the community, having being released on warning. Sokolo said a day after his shack was burnt and he was beaten, some community members approached him on the street and asked for forgiveness, saying they made a mistake and that he should drop the charges. And Sokolo says all he wants is a place to stay and the law to take its course. He said he even asked police to come clear the tension but when he came into the area with police this Friday, he said the residents shouted at him and threatened to kill him if they saw him again. A resident, who refused to give his name, said he was there when the community beat Sokolo. “He is a thief. We don’t want him here. If he comes again we will see what to do with him. He was lucky he was not killed,” said the resident.